For those folks who have constraints that do not allow you to put up a big HF antenna then take a look at the MFJ-1796 6-band antenna. This antenna covers 5 HF bands and the 2 meter band. HF bands covered are 40m, 20m, 15m, 10m, and 6m. We’ve been using this antenna for about 8 years on HF with good results. To have one antenna cover all these bands is a convenience. At the outset we should say that this review of the MFJ-1796 is for a very special circumstance. We have made a slight modification to the antenna and we use it in a slightly different position than recommended. Look at the picture to the left. That is the antenna that MFJ will deliver. But we have changed it a bit – read on. The quote below is directly from the MFJ-1796 assembly manual and briefly describes the antenna structurally and electrically. The basic 40 meter quarter wave vertical antenna is 33′ tall and requires a reasonably good ground or counterpoise system to function properly. The usual way to eliminate the requirement for a complicated and space consuming ground system is to center feed a 1/2 wave (in this example a 66′ tall) antenna. The six and two meter amateur bands are covered with the addition of four quarter wave decoupling stubs. The power rating of the antenna is 750 watts on six meters and 300 watts on two meters. MFJ solved these problems by combining efficient end loading with a balanced center feedpoint design. The result is a physically small vertical antenna that gives good performance and does not require any type of RF ground system. The reduction in size is accomplished by adding separate loading coils and capacitance hats at each end of the antenna for the HF bands. The efficient end loading coils are wound on fiberglass forms. The high quality materials and construction of the HF loading system allows a maximum power rating of 1500 watts on 40, 20, 15 and 10 meters. The continuous CW power ratings are 500 watts on 40 meters, 750 watts on 20 or 10 meters and 1000 watts on 15 meters. So lets get to the bottom line on this antenna – its a balanced dipole with loading coils (not traps) and capacity hats at each end. The length of the antenna is 12 feet as delivered from MFJ. Its as simple as that. The MFJ-1796 as delivered by MFJ is expected to be used as a vertical and mounted on the ground, on a tripod on a roof, or attached to a chimney. Its a center-fed vertical dipole that is ground independent – that is, it does not require a counterpoise or grounding system. You can surely use this antenna in the manner as recommended by MFJ. But we had different plans. The MFJ-1706 is just a dipole. So why not use it horizontally in an attic? That was our plan. All it needs is 12 feet of linear space to cover 5 HF bands – 40 meters, 20 meters, 15 meters, 10 meters and 6 meters. 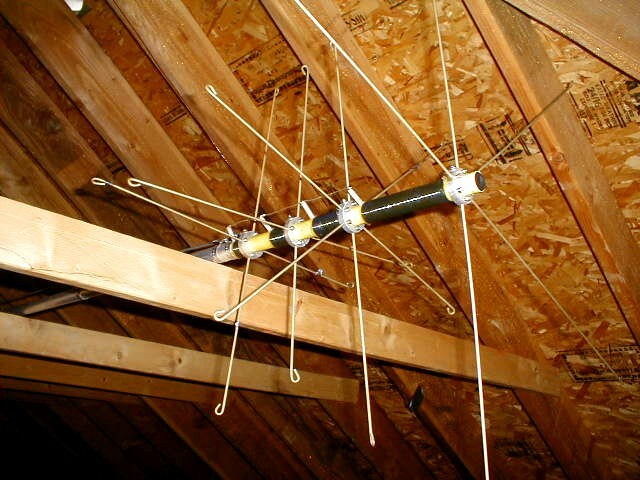 Now, if you are one of those people who live in a neighborhood where YOUR estimation is that an HF antenna is going to create – what regular people call – “an eyesore” – then the attic installation of the MFJ-1796 has an additional plus that it will not disturb the “decorum” of the neighborhood. Once you know that this antenna is nothing but a loaded dipole with capacity hats assembly in conceptually simple. You just need to mechanically assemble all the parts. Tuning the antenna is a different matter. You should tune this antenna – or any antenna for that matter – in an environment as close as possible to the final positioning of the antenna. So, for the conventional install on the ground or in the air on a tripod or on the roof or chimney – you be the judge on how you will tackle this 12 foot tall antenna – in its final position. But again, we had a different plan for this antenna – in the attic. This allows one to “get up close and personal” to the entire length of the antenna for tuning purposes. So, we just took the MFJ-1796 up into the attic, laid the antenna across existing supports in the attic – that the builder provided – obviously for this exact purpose – and we gave it some initial rough tuning and a test. Sure enough low SWR on all the bands. This told us that we had a good RF environment in the attic in a horizontal position and the the fine tuning was not going to be a problem. Also, the horizontal position would give us easy access to both ends of the antenna. At the time, and still do, we have a 20m dedicated inverted V-dipole in the attic. We did some A-B tests between the dedicated 20m inverted V dipole and the MFJ-1796 and found no difference in received signal strength to the resolution of the bar graph on our Kenwood TS-950S. The 20m dedicated dipole and the MFJ are broadside the same direction so neither had a directional advantage. However – 2:1 SWR bandwidth on 20m was much less on the MFJ-1796 than the full length 20m dipole -as expected. You can see the actual measurements later in this posting. Again, the MFJ-1796 as delivered from MFJ is designed to be mounted as a vertical center-fed dipole. Given this, it is L-shaped. The bottom of the antenna is in the shape of an L due to this mounting intention. Inspection of the antenna disclosed that one can simply remove the bracket on the bottom of the antenna and mount the end section that is on the L-section bracket containing the loading coils and capacity hats right on the main tube of the dipole. Very simple. We made this change. If you inspect the picture above, you will see that the L-bracket that holds the lower section also has a Balun. The balun is now on the attic floor. The feeding coax attaches to the balun. The balun feeds the center-feed of the dipole that you can see to the left. The center of the dipole is simply two aluminum tubes connected to a center insulator with hose clamps. Both ends of the antenna now look like the picture above – the loading coils and capacity hats. The antenna is now structurally symmetric. What you see above is exactly what is at the other end. Bottom line, after the mod, we now have a true center-fed balanced dipole. This change added about 2 more feet the the lengh of the antenna. Therefore, the total length of the 5-band antenna is now about 14 feet in length. No extra parts were needed to make this structural change to the antenna. Changing this antenna from a L-shaped vertical center fed dipole to a true electrically and physically balanced horizontal dipole did not affect any ability to tune this antenna to resonance on any of the bands. However, we must tell you that tuning this antenna is tedious. You need to cut the capacity hat spokes to correct lengths. Its a matter of cutting and testing. An antenna analyzer would come in handy at this point. If you do not have such a device – it’s a lot of trips up and down the attic stairs. For 40m since the 2:1 bandwidth is narrow you need to pre-plan the tuning based on the part of the band you want to use most. Below are the actual measurements for SWR and each the bands. Note the bandwidth on each of the bands. The “center” of the bands can be moved by changing the spoke lengths. MFJ gives you extra spokes if you cut too much. Home Depot or a similar home improvement store can provide additional rods if you run out. We did a lot or pre-planning and did not have to use any of the extra spokes MFJ provided. One can see that the MFJ-1796 is usable on all the bands with good SWR. On 15 meters, the SWR is under 1.5 for the entire band. On 20 meters, pick you spot. We hang around on centered on 14.225. As a comparison with our dedicated 20 dipole the 1.5 SWR bandwidth is 13.908 – 14.449. The entire band. So you can see that the MFJ-1796 is a compromise – as we know. On 40 meters, pick your spot for tuning. We hang around 7.175. So that is where we chose to center the lowest SWR – which was 1.2:1. We have made thousands of contacts on this antenna over the past 8 years or so. At 150W out using our Kenwood TS-950S we have no RF problems in the house. At 150 Watts, even with the TV Cable routed around the attic and electric conduit we have no TVI or other negative electrical effects. Audio does not bleed through any of our speakers in the house. Of course the MFJ-1796 is a compromise – we know that. If you live on a farm – this antenna is not for you. If you live in the wide open spaces – this antenna is not for you. If you can put up a big antenna outdoors and not disturb the decorum of the neighborhood – then this antenna is not for you. 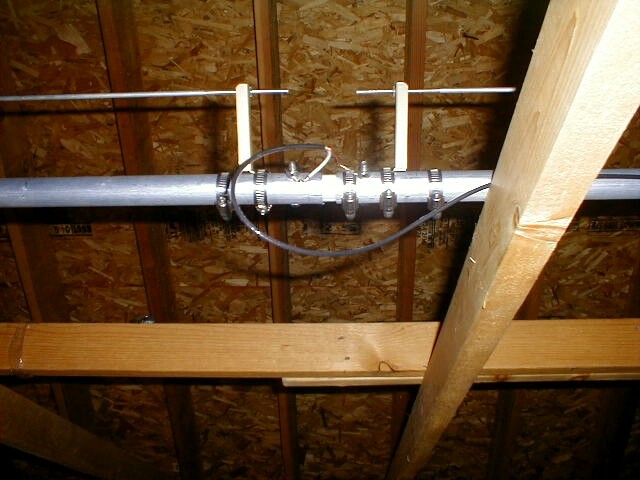 However, if you have limited space – if you have about 14 feet of linear space in an attic – then this antenna may be a good choice for you. It can do 5 HF bands with low SWR and no band switching or adjustments after initial tuning. The MFJ-1796 is a compromise of performance for convenience. If you limited space ( or limited eyesore ) constraint is making the difference between working 5 bands and not working 5 HF bands – the consider the MFJ-1796. Street price at the time of this writing is about $200. How much to cut off and what procedure would be very helpful. Did you tune each band in steps one at a time or take initial measurements and then cut every band at one time according to calculations provided in the manual? Many that I have read or spoke with have difficulty bringing a band in tune without destroying other bands. Each individual band can be made resonant with good SWR but not all in my experience. Below 2.0 would be good. It has great performance on tuned bands. Hi, any idea how much you trimmed on the 40m to get a decent SWR? I just put together my MFJ-1796 and I am getting pretty high SWR (if memory serves it was about 2.9:1. I trimmed about 1/2″ on the longest spokes but ran out of energy. I’ll pick it back up again probably on Sunday afternoon – trimming 1/2″ at a time. I just came across your article via Google. 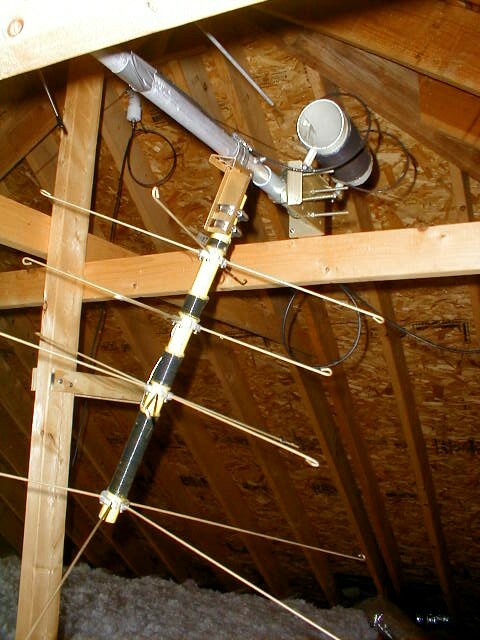 I used this antenna for six years in the UK in the attic space and it performed very well. I only work QRP CW and I almost achieved dxcc with it (I moved country before I could complete the 100!). I now live in VE7 and have the same problem with antennas here as I did in the UK. I decided to go once again with the 1796 in my attic. However, I never considered straightening out the dog-leg: great idea! I have a lot of loft space, so the extra couple of feet won’t be a problem at all. Hacksawing the rods is a bit of a drag, but with a MFJ-259B or similar, it’s a snap. You only have to do it once, then you’re good for life. I had hoped that I might be able to tune it to the WARC bands, which I love, but I never managed to do so. I note from eHam that others have managed to tune it with external tuners. Do you have any suggestions for this? Thanks for the article and the great ‘balancing’ tip! I can certainly recommend this antenna for those with limited space and requiring an ‘invisible’ antenna. 73 Steve VE7GTU (ex G4GTU). My guess is that if you tune it for WARC you are going to lose something you already have. As far as cutting (hacksawing) the rods. What I did was use a file and just scored the rod at the place I wanted to remove and then “broke it off” with a pliers. Once you have the spokes at the righ length – as you said – you are set for life. You can make small adjustments on 40m by bending the spokes slightly to change the capacitatance without cutting. Finally, for anyone NOT mounting this on the ground I would suggest you “straighen out” this L-shaped antenna. You don’t need any hardware to do this. When you straighen out this antenna you will get a nice symetrical dipole. You can mount it vertically or horizontally. Horizontally you would have effectively a rotatable dipople. My guess is that with it’s L-shape it might have an unusual RF pattern with perhaps some nulling – it would not be the nice symetrical pattern that you seen associated with a traditional dipole. If you can afford to live in BC you can afford a new antenna – I have a 1796 on order and I appreciate your article 1) because I will hang it on the roof and if nobody complains – fine. 2) If they do complain I should be able to fit it easy (one piece at a time) into the attic to be reassembled. I hope I fit in the attic! Have just read the above with much interest. I am planning on putting up the MFJ-1795 in very small back yard which will be hidden with trees. However if the antenna police should find it I would relocate it to the attic as you have done. My only problem in doing that is now it would be a directional antenna. My attic runs north to south and I am located about 1000′ from the atlantic ocean. Well John, look at the positive side, you can make some new friends in a new direction. Yes, the antenna is just a diople and is directional. This antenna is easy to move around. If you do have to move it to the attic then I would suggest that you reconfigure it from its L-shape to a linear shape as I have done. No extra hardware is needed. This antenna has worked for me for a long time as a limited space compromise antenna. If you look at my SWR measurements you can see you can work 40,20,15,10, and 6 with no problem off this single antenna. It does 2m as well.